Prehistoric Shark Week, Day 5: From Whence the Great White? Greetings and welcome to the final day of Prehistoric Shark Week! All week we have covered sharks that swam in Arkansas during the Cretaceous Period. The dinosaurs get all the press, but we had a diverse marine ecology during that time. 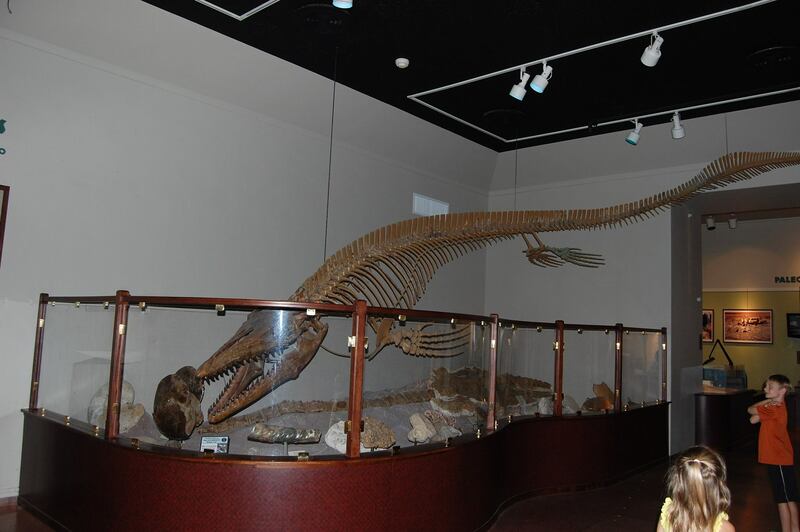 Last week, we met a few of the non-shark denizens, such as mosasaurs, elasmosaurs, and more. This week, we have seen nurse sharks, goblins, sand tigers, and an array of rays, skates, and angel sharks. We wrap up the festival of marine animals with the question that everyone wants to know. Where did the most famous sharks of all time, the Great White and Megalodon, come from and how does Arkansas play into this? A collection of galeomorph sharks that made their home in Cretaceous Arkansas and much of the world’s oceans, appropriately scaled. The Great White, or simply White Shark, is named Carcharodon carcharias, meaning sharp tooth pointer, although more popularly named for its white belly, is well known as the largest living predatory fish in the sea, reaching up to and, probably over, 20 feet. Megalodon, listed either as Carcharocles megalodon or Carcharodon megalodon, depending on whether or not one believes it is directly related to or convergent with White Sharks, is the largest known predatory fish ever, reaching sizes up to three times that of the White Shark. It appeared in the fossil record about 16 Mya, but went extinct 1.6 Mya (contrary to what a fictitious documentary on the Discovery Channel claimed). During the Cretaceous, the southwestern part of the state was covered by the Western Interior Seaway, which for us, was essentially equated to having the Gulf coast not just on our doorstep, but flooding it. Those waters were warm, rich in nutrients, and a hotbed of marine life. In those waters, a few sharks of interest made their home. All of the sharks we will be talking about are lamniform sharks. These sharks are known for being at least partially endothermic, meaning they used their core muscles to create their own heat and maintain an elevated body temperature, giving them the ability to be active hunters even in cooler waters. Of course, it also meant they were hungrier, needing more food, keeping them always on the prowl. This is what allows the White to be such a fearsome hunter today, giving it the power and energy to breach completely out of the water during attacks. Squalicorax is an extinct shark of the time that is commonly thought to have resembled Whites. These sharks got up to five meters, although they were typically around two meters. Squalicorax is also called the Crow Shark, which some people have speculated it got that name from evidence of its scavenging. However, squalus means shark (and is the scientific genus name for dogfish) and corax means crow, so the name Squalicorax literally means crow shark. Now as to why it was named that way to begin with, no one knows because when Agassiz named it in 1843, he didn’t leave a record as to why. They hunted and scavenged a wide range of animals, everything from turtles to mosasaurs. Unfortunately, the relationships between Squalicorax and other lamnids is uncertain, so whether or not it could have been ancestral to anything, much less Whites or megalodons, is unknown at present. Another candidate is a shark named Isurus hastalis, an Oligocene shark that lived 30 Mya. Isurus also includes the modern day mako shark. However, a researcher by the name of Mikael Siverson concluded that the Isurus teeth were not makos, but worn down teeth similar to modern Whites. So he changed the name to Cosmopolitodus. It has also been suggested that these sharks originated from a shark called Isurolamna, which lived in the paleocene 65-55 Mya. A more recent view, and one which I back (with freely admitted bias because it allows me to say they evolved from Arkansas sharks:) ), is that both Whites and megolodons evolved from an extinct lamnid called Cretolamna, the Cretaceous lamna. This shark had large, strong teeth and was very successful. It had a worldwide distribution and lived from the Cretaceous to the Paleocene. Cretolamna fossils have not been reported in Arkansas thus far, but they were a member of the family Cretoxyrhinidae, of which the shark Serratolamna was a member. The teeth of Cretolamna and Serratolamna are extremely similar, as one might expect from genera in the same family. However, Serratolamna teeth have serrations and Cretolamna does not, making Serratolamna teeth closer in shape to the White Shark. Serratolamna did not have the same worldwide distribution and did not last as long as long as Cretolamna, though. It is impossible to tell which one was directly ancestral to the later sharks, but Cretolamna, due to its more cosmopolitan range, has gotten the nod. It was named first and is much better known than Serratolamna, giving it an edge when people find and identify fossil shark teeth. Thus, it is not a big stretch to say that Serratolamna, or a very close relative, eventually evolved into Carcharodon carcharias as well as Carcharocles (or Carcharodon) megalodon. Serratolamna gafsana. Wikipedia. Photo by Hectonichus. I hoped you have enjoyed Prehistoric Shark Week and the previous week of Cretaceous Arkansas marine predators. Let me know if there is another group that you think deserves special consideration for a celebratory week. For Day 4 of Prehistoric Shark Week, I would like to mention another modern day shark that has been around since the Cretaceous: the sand tiger sharks. Tomorrow, I will discuss a couple of Cretaceous sharks that may be the ancestors of the two most famous sharks in the world – the Great White and the giant Megalodon. The Sand tiger is a common shark in the Cretaceous sediments, or at least, their teeth are, which means they were probably pretty common back then. The teeth tend to be long and thin, with two small cusps on either side of the large, center blade. Elasmo-branch.org reports that the center blade is smooth-edged with a strongly bilobed root, large bulge in the center of the root (aka lingual protruberance), and nutrient foramen in the center. There are actually two sharks that are often called sand tigers in the Cretaceous rocks. One is Carcharias holmdelensis, the Cretaceous version of Carcharias taurus, the modern day sand tiger shark. Also going by the name grey nurse shark, amid several others, sand tigers are large-bodied sharks that will eat pretty much anything, but since it is a fairly slow and placid shark most of the time, it doesn’t seem to go after anything that requires a lot of effort. They are known for gulping air to allow themselves to float in the water column without expending much effort. So although they look scary, they appear to be too lazy to live up to appearances. Welcome to Day 4 of Paleo-Animal Fest, celebrating the creatures populating the Arkansas seas during the Cretaceous. Today we are going to look at a fish that has survived for an amazingly long time. They first appeared in the Late Cretaceous and have survived to the present day, still thriving. You can find them in many freshwater lakes and rivers, especially brackish and hypoxic (low oxygen) waters, even into marine waters on the occasion. They are a tough predator in many ways, from their durability in the fossil record to their physical defenses and their intimidating jaws. I am of course talking about gars. Gars can be found in many places within North America, but their fossils can be found all over the world. The vast majority of the fossils have been identified as Lepisosteus, which includes the longnose, shortnose, spotted, and Florida gar. However, most of their fossils are isolated scales, which makes it difficult to impossible to tell what type of gar it is from. So I am going to go with most people’s favorite gar, Atractosteus spatula, the alligator gar (pictured above). It is the biggest one reaching almost 3 meters. Another impressive armored, ancient fish that is still around is the sturgeon, which can get a lot bigger, but are nowhere near as impressive in the teeth department. There are not a lot of skeletons of gars with heads and tails, but there are a lot of body pieces covered in scales. Gar scales are thick, rhomboid-shaped ganoid scales, meaning they are covered in what is effectively enamel. The scales form an excellent armor, making handling them hard on the hands. They are so tough and dense, in fact, that the scales have been used as arrowheads and make even CT scans on gars hard to impossible to get decent views. On the plus side, this results in them having excellent preservational potential and can be found quite commonly. The scales make the fossils really stand out and readily identifiable to at least the group Lepisosteiformes. By far, the most complete and detailed description of gars ever published is by Lance Grande, the universally acknowledged leading world expert on fossil fish, called “An empirical synthetic pattern study of gars (Lepisosteiformes) and closely related species, based mostly on skeletal anatomy. The resurrection of Holostei.” Special publication 6 of the American Society of Ichthyologists and Herpetologists, published in 2010. This is a massive tome, amassing almost 900 pages of detailed observation on gars. This book is a companion to a similar volume he did on bowfins. I can honestly say I have never seen a more thorough job on any group such as this in my life. Every time I look at it, I think wow, all this on just gars? This would make any scientist proud to have one of these capping their life’s work and this doesn’t even begin to touch the work put out by Grande. I am in awe. Monday was a goniopholid crocodilian. Tuesday was mosasaurs, the largest of the marine predators. For day 3, we’re going to the other end of the scale. What is a picture of a rock outcrop doing here? This is a picture of the Saratoga Chalk, courtesy of the Arkansas Geological Survey. Look at it this way, and it is tons of chalk, the same that they used to make for blackboards when they used the real thing. But look at it under a microscope and you open up an entirely new world. For chalk is not just a rock. It is a rock made of trillions of shells of microscopic organisms that live in the oceans. Two kinds of microorganisms make up most of the chalk. The Saratoga is primarily noted for its abundance of foraminifera, (forams for short) one-celled organisms that form shells, or tests, out of minerals dissolved in the sea water. The ones that make up chalk and limestone form theirs out of calcium carbonate. It is unclear what they are related to, but one thing is clear. They have developed a huge diversity in their over 500 million years of existence. I find forams fascinating because of their wonderful diversity. Here is another picture posted on the blog “Letters from Gondwana.” The article is a nice description of forams if you want more information on them. The other group that is commonly found in chalk is called the coccolithophores. These are very tiny, once-celled plants found in the ocean and make up one of the largest groups of phytoplankton. They also make shells of calcium carbonate, but instead of a shell like the forams, they create their home with a few dozen intricately formed scales. The coccolithophore Gephyrocapsa oceanica. Wikipedia. When the cells die, the scales scatter and become tiny grains of calcium carbonate which, when piled up on the ocean floor with all the other debris from the oceans, can form those particles of chalk that you used to clean off the blackboard. Both of these groups prefer shallow, warm seas. Go to the Bahamas or the Persian Gulf and you will get an idea of the environments that are admirably suited to making modern day chalk, as well as getting a good idea of what Arkansas was like 100 million years ago. 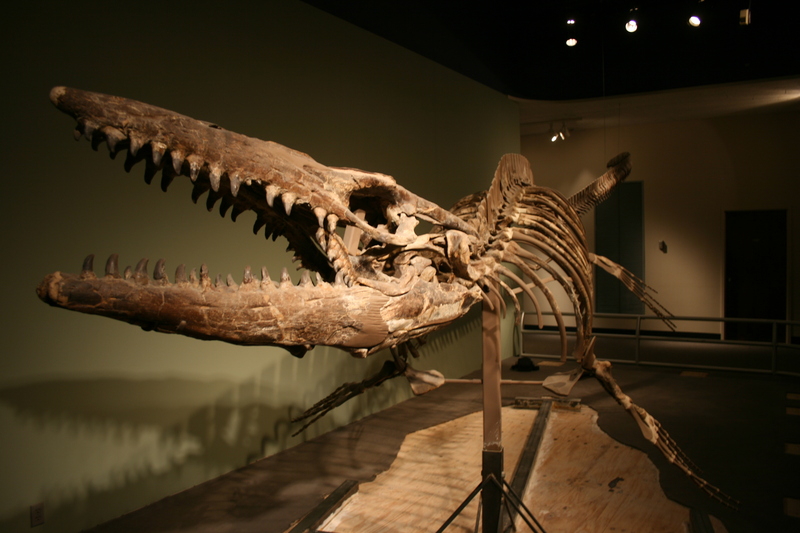 Continuing our celebration of marine animals of the Cretaceous found in Arkansas, here is a picture of a mosasaur. It is from the Dallas (Perot) Museum of Nature and Science. They have a great display of several different mosasaurs. You can also see one on display at the natural history museum located at the University of Texas at Austin. Mosasaurs were the apex predators of their time, which was in the Late Cretaceous. Tyrannosaurs may have ruled the land, but mosasaurs ruled the seas. The first mosasaurs appeared in the early Cretaceous, but by the end, they dominated the oceans. Unfortunately for them, they only had a 20 million year or so run at the top before the mass extinction at the end of the Mesozoic Era wiped them out along with the dinosaurs. Mosasaurs were not related to dinosaurs, other than also being reptiles. They were most closely related to the group of lizards that include the monitor lizards, such as the Nile monitor and Komodo Dragon. They were fast predators with a powerful tail to move them through the water. Mosasaurs were so adapted to the water that they bore live young and were not able to walk on land, although they did still have to surface for air like every other reptile. Recent research has found they were endothermic (warm-blooded), unlike their competitors, giving them an edge by allowing them to sustain higher activity levels. It also meant they had to eat more often, making it necessary for them to be effective hunters. Research has also indicated they were countershaded, with a lighter belly than the back, much like many sharks of today. They had a varied diet, with some species specializing in different prey, so over the whole group, they pretty much ate everything in the ocean. Mosasaur bones have been found in many places throughout southwest Arkansas, which was covered by the Western Interior Sea during the Cretaceous. Two species have thus far been recognized. Platecarpus was fairly small, only 4-5 meters (13-16 feet), but were noted for some exceptionally preserved fossils that retained the impressions of a tail fluke, allowing paleontologists for the first time to see what their tails looked like. The other species is Mosasaurus itself, a huge predator that reached lengths of 15-18 meters (50-60 feet). Welcome back to the new school year. Some of you will be excited to be back, seeing old friends, making new ones, and learning new things. Some of you will be sad to see summer end. Many of you will be doing both at once. Others of you of course aren’t in school and don’t care about it, but if you are here, you are nevertheless interested in learning cool new stuff. So it is a time for a celebration of the natural world. Shark Week is a big summer event on the Discover Channel. It is probably their biggest viewer draw all year. Who doesn’t like learning about sharks and seeing them in all their awe-inspiring glory? Additionally, if one is keeping up with the weather, southern Louisiana is currently being deluged, with Baton Rouge and surrounding areas practically getting washed away. So I thought this would be a good time for Paleoaerie to hold its own version of Shark Week. I can’t do a series of tv specials, so I am going to extend my Paleo Shark week over two full weeks. All this week I will be putting up short posts on marine creatures that swam in the oceans of southern Arkansas during the Cretaceous. Every day will be a new post on something that would make your swim…interesting. Next week will truly be Paleo Shark Week. Every day next week will be highlighting a different shark that would be swimming in the Cretaceous waters of southern Arkansas. To kick things off, I will start with this creature. This is a crocodylomorph, meaning that it is in the same group that includes crocodiles and alligators. Specifically, it is a member of the family Goniopholididae. Species in this group were, at least superficially, similar to modern crocodilians. They were semi-aquatic hunters living in marsh and swamp lands. They wouldn’t look out of place with the modern alligators swimming around Arkansas today, except that they probably couldn’t compete effectively with alligators, who are better adapted for the lifestyle than they were. They lived throughout much of the Mesozoic, from the early Jurassic to the Late Cretaceous, when the more modern forms replaced them. Goniopholids are what is known as mesosuchians, which means “middle crocodiles”. Mesosuchians, as the name suggests, were more derived than the earliest crocodyliforms, such as the protosuchians, although less derived than modern-day crocodilians. Mesosuchians is not a formal name, but an informal and decidedly paraphyletic (i.e. not a valid cladistic grouping because it leaves out some descendants) name to designate those crocodyliform species showing the early characteristics and those that show the characteristics of the modern crocodilians. Here is a phylogenetic tree put out by Chris Brochu in 2001, showing the general relationships within the crocodylomorphs. The names on the left side of the long main line include everything from that point on, e.g. Crocodymorpha includes “sphenosuchians” and everything below it, but not the Aetosauria and above. Mesosuchians plus Eusuchia (which does include all modern groups) can correctly be called Mesoeucrocodylia, but that hardly helps us specify the group. Simosuchus, Royal Ontario Museum. Photo by Gordon E. Robertson. Mesosuchians include a wide variety of animals with a large number of species. They include terrestrial animals like the carnivorous boar croc Kaprosuchus and the herbivorous Simosuchus, as well as the more typical semi-aquatic pholidosaurs, which include the super croc Sarcosuchus, one of the largest crocodylomorphs ever, reaching almost 40 feet. Sarcosuchus may not have been quite as big as Deinosuchus though. Deinosuchus was an alligatoroid (within the larger alligator family, but not a modern alligator), which potentially reached upwards of 40 feet, but may have been heavier set. Sarcosuchus lived in the early Cretaceous at the same time as Goniopholis in Arkansas, but lived in Africa and South America. Deinosuchus, on the other hand, lived int he Late Cretaceous right here in Arkansas. While we have no bones to prove this, we do know they lived in Texas and Mississippi, as well as many other places in the United States. The environment would have been suitable for them, so there is no reason to think they did not live here as well. Sarcosuchus life size model “attacking” my family.